The relationship of art and science is a story told vividly through the world of botanical illustration. With the rise of interest in North American natural history during the 19th century many talented, and often unrepresented artistic figures were made. 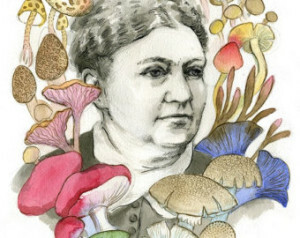 In this talk we will meet one of those figures, Mary Banning, whose forgotten manuscript ‘The Fungi of Maryland’ is emerging as an essential record of one woman’s journey into the world of fungi. Banning (1822-1903) illustrated and identified fungi when reference material was scarce and a woman’s participation in science was laregely unacknowledged. In this seductive compendium, scientific observation, personal anecdote and 174 watercolor illustrations meet to form a rich record from the past, and feels as relevant as ever today. Alanna Burns is an artist, craftsperson and amateur mycologist in New York. It all started when Alanna saw five different species of mushrooms growing on her block in Bed Stuy. When she discovered one could be used to dye her pants, she was all in. Alanna works with nature’s materials in Wingdale, NY and helps people to see that fungi are everywhere, can heal and nourish, even set you free.